The tutorial explains the specificities of the Excel Rank functions and shows how to do ranking in Excel based on multiple criteria, rank data by group, calculate percentile rank, and more. When you need to determine the relative position of a number in a list of numbers, the easiest way is to sort the numbers in ascending or descending order. If for some reason sorting is not possible, a Rank formula in Excel is the perfect tool to do the job. The RANK function in Excel returns the order (or rank) of a numeric value compared to other values in the same list. In other words, it tells you which value is the highest, the second highest, etc. In a sorted list, the rank of a certain number would be its position. 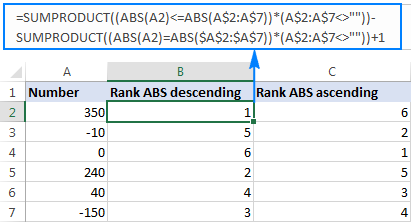 The RANK function in Excel can determine the rank starting with the largest value (as if sorted in descending order) or the smallest value (as if sorted in ascending order). Number (required) - the value whose rank you'd like to find. Ref (required) - a list of numeric values to rank against. It can be supplied as an array of numbers or a reference to the list of numbers. If 0 or omitted, the values are ranked in descending order, i.e. from largest to smallest. If 1 or any other non-zero value, the values are ranked in ascending order, i.e. from smallest to largest. 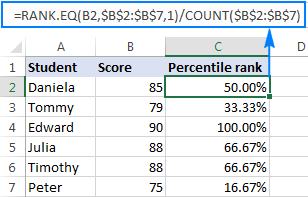 RANK.EQ is an improved version of the RANK function, introduced in Excel 2010. It has the same syntax as RANK and works with the same logic: if several values are ranked equally, the top rank of that group of values is returned (EQ stands for "equal"). 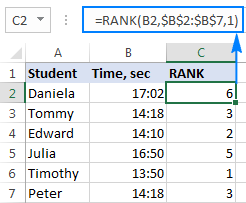 In Excel 2007 and lower versions, you should always use the RANK function. 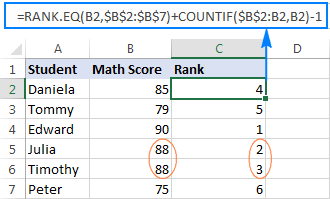 In Excel 2010, Excel 2013, and Excel 2016, you can go with either RANK or RANK.EQ. However, it'd be wise to use RANK.EQ because RANK can be discontinued at any moment. RANK.AVG is another function to find rank in Excel that is available only in Excel 2010, Excel 2013, Excel 2016 and later. The difference is that if more than one number has the same rank, the average rank is returned (AVG stands for "average"). Any Rank formula in Excel works only for numeric values: positive and negative numbers, zeros, date and time values. Non-numeric values in the ref argument are ignored. All RANK functions return the same rank for duplicate values, and skip subsequent ranking, as shown in the example below. 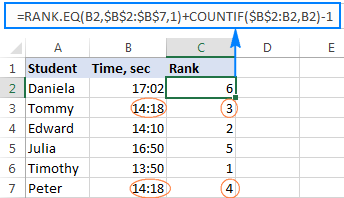 In Excel 2010 and later versions, the RANK function has been replaced with RANK.EQ and RANK.AVG. For backward compatibility, RANK still works in all versions of Excel, but it may not be available in the future. If number is not found within ref, any Excel Rank function would return the #N/A error. The RANK and RANK.EQ formulas give a rank of 2 to both duplicate scores. The next highest score (Daniela) is ranked 4th. A rank of 3 is not given to anyone. The RANK.AVG formula assigns a different rank to each duplicate behind the scenes (2 and 3 in this example), and returns the average of those ranks (2.5). Again, the 3rd rank is not assigned to anyone. The path to excellence, they say, is paved with practice. So, to better learn how to use RANK function in Excel, alone or in combination with other functions, let's work out solutions to a few real-life tasks. 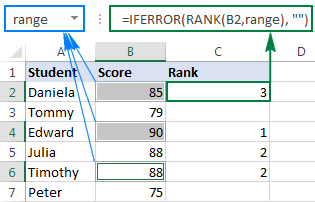 As shown in the above example, to rank numbers from highest to lowest, you use one of the Excel Rank formulas with the order argument set to 0 or omitted (default). To have number ranked against other numbers sorted in ascending order, put 1 or any other non-zero value in the optional third argument. Please pay attention that we lock the range in the ref argument by using absolute cell references, so that it won't change when we copy the formula down the column. As the result, the lowest value (fastest time) is ranked 1st and the largest value (slowest time) gets the lowest rank of 6. The equal times (B2 and B7) are given the same rank. As pointed out earlier, all of the Excel Rank functions return the same rank for items of equal value. If that's not want you want, use one of the following formulas to resolve tie-break situations and give a unique rank to each number. As you may have noticed, the only difference between the two formulas is the order argument of the RANK.EQ function: omitted to rank values descending, 1 to rank ascending. In both formulas, it's the COUNTIF function with the clever use of relative and absolute cell references that does the trick. In short, you use COUNTIF to find out how many occurrences of the number being ranked there are in the above cells, including the number's cell. In the topmost row where you enter the formula, the range consists of a single cell ($B$2:B2). But because you lock only the first reference ($B$2), the last relative reference (B2) changes based on the row where the formula is copied. Thus, for row 7, the range expands to $B$2:B7, and the value in B7 is compared to each of the above cells. Consequently, for all unique values and 1st occurrences of duplicate values, COUNTIF returns 1; and you subtract 1 at the end of the formula to restore the original rank. For 2nd occurrences of duplicate values, COUNTIF returns 2. By subtracting 1 you increment the rank by 1 point, thus preventing duplicates. If there happen to be 3 occurrences of the same value, COUNTIF()-1 would add 2 to their ranking, and so on. The first function determines how many values are greater than or less than the number to be ranked, depending on whether you are ranking descending or ascending, respectively. The second function (with the "expanding range" $B$2:B2 as in the above example) gets the number of values equal to the number. The previous example has demonstrated two working solutions for an Excel RANK tie break situation. However, it may seem unfair that equal numbers are ranked differently based solely on their position in the list. To improve your ranking, you may want to add one more criteria to be considered in case of a tie. The first criteria_range/criteria pair ($B$2:$B$7,$B2) counts the occurrences of the value you are ranking. Please notice, we fix the range with absolute references, but do not lock the criteria's row ($B2) so that the formula checks the value in each row individually. The second criteria_range/criteria pair ($C$2:$C$7,">"&$C2) finds out how many total scores are greater than the total score of the value being ranked. Because COUNTIFS works with the AND logic, i.e. 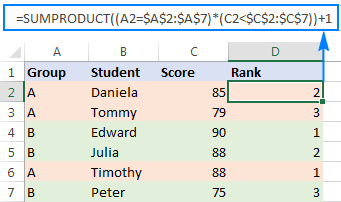 counts only cells that meet all of the specified conditions, it returns 0 for Timothy since no other student with the same Math score has a higher total score. Hence, Timothy's rank returned by RANK.EQ is unchanged. For Julia, the COUNTIFS function returns 1 because one student with the same Math score has a higher total, so her rank number is incremented by 1. 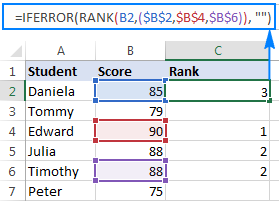 If one more student had the same Math score and a total score lower than that of Timothy and Julia, his/her rank would be incremented by 2, and so on. The result of these formulas are exactly the same as shown above. In statistics, a percentile (or centile) is the value below which a certain percentage of values in a given dataset falls. For example, if 70% of students are equal to or below your test score, your percentile rank is 70. A2:A7 are groups assigned to numbers. C2:C7 are numbers to be ranked. First, you check the group (A2=$A$2:$A$7). This part returns an array of TRUE and FALSE based on whether a range element belongs to the same group as A2. Second, you check the score. To rank values from largest to smallest (descending order), use the condition (C2<$C$2:$C$11), which returns TRUE for the cells greater than or equal to C2, FALSE otherwise. Since in Microsoft Excel terms, TRUE = 1 and FALSE = 0, multiplying the two arrays gives an array of 1's and 0's, where 1 is returned only for the rows in which both conditions are met. Then, SUMPRODUCT adds up the elements of the 1's and 0's array, hence returning 0 for the largest number in each group. And you add 1 to the result to start ranking with 1. The formula that ranks numbers within groups from smallest to largest (ascending order) works with the same logic. The difference is that SUMPRODUCT returns 0 for the smallest number in a particular group, since no number in that group meets the 2nd condition (C2>$C$2:$C$7). Again, you replace zero rank with the 1st rank by adding 1 to the formula result. 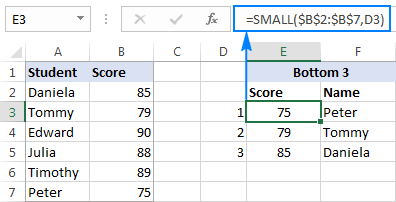 If your list of numbers contains both positive and negative values, the Excel RANK function will rank them all in no time. But what if you'd like to have positive and negative numbers ranked separately? In the logical test of the IF function, you check whether the number is greater than zero. If the number is greater than 0, the COUNTIF function returns the count of values higher than the number being ranked. In this example, A2 contains the 2nd highest positive number, for which COUNTIF returns 1, meaning there is just one number greater than it. In order to start our ranking with 1, not 0, we add 1 to the formula result, so it returns a rank of 2 for A2. If the number is greater than 0, the formula returns an empty string (""). If the number is greater than 0, the first COUNTIF gets the total count of positive numbers in the data set, and the second COUNTIF finds out how many values are higher than that number. Then, you subtract the latter from the former, and get the desired rank. In this example, there are 5 positive values, 1 of which is greater than A2. So, you subtract 1 from 5, thus getting a rank of 4 for A2. Formulas to rank negative numbers are based on a similar logic. Note. All of the above formulas ignore zero values because 0 belongs neither to the set of positive nor to the set of negative numbers. To include zeros in your ranking, replace >0 and <0 with >=0 and <=0, respectively, where the formula logic requires. Where B2:B10 is the range of numbers to be ranked. At first sight, the formula may seem a bit tricky. Upon a closer look, the logic is very simple. When dealing with a list of positive and negative values, there may be a need to rank numbers by their absolute values ignoring the sign. If you wish to get an actual N number of the largest or smallest values rather than their ranking, use the LARGE or SMALL function, respectively. Where B2:B7 is the list of scores and D3 is the desired rank. That's how you do ranking in Excel. To better understand and probably reverse-engineer the formulas discussed in this tutorial, you are welcome to download our Sample Rank Excel workbook. 28 Responses to "Excel RANK functions with formula examples"
In RANK.EQ function why rank 2 is skipping to Rank 3 on re applying marks. Could you help me please. How to rank this in excel? If it doesn't help, then please send me a small sample workbook with your source data and the result you expect to get to support@ablebits.com. Please don't worry if you have confidential information there, we never disclose the data we get from our customers and delete it as soon as the problem is resolved. I'll look into your task and try to help you better. I have 4 Sub category each I'll give 25% ( how to find out Ranking). Thanks for helping me out to calculate Ranking of two pupils that had the same average and the same total but different positions. I was able to sort it out through your formula. Is there a simple way to automatically sort without using macros. The formulas work like a charm. I have a hard problem solving these: I had rank it initially based on standard queuing, from there, it will subsequently re rank once the second line be queued. what should be the best formula to get the final ranking??? At the outset thanks for helping people like us. Thank you for these. I haven't used them in a while and this was exactly the refresher I needed. Cheers! I have a list that is ranked and now I have to give the ranked list a grade (E - Excellent, O - Outstanding, M - Meets Expectations, B - Below Expectations). I can only have 10% of my list be Exceptional, 15% outstanding, 65% Meeting Expectations, and 10% below expectations. I have 34 employees that make up this list. I can manually assign the grades based on this but is there a way to have excel do this for me? This is AWESOME!! I was headed in the right direction logically, but this was the answer to MANY hours of trial and error!!! Please see the data below where I want to calculate Overall Rank from existing ranked criteria. Note that to calculate overall rank, Rank 1 is the main criteria, followed by Rank 2 and 3. Please let me know if you have pre-built formula for this. The Rank.eq function will not allow me to lock the ref array. I can't figure out why this is happening. Do I have to hand enter each and every cell? To lock the ref range, use absolute cell references with the $ sign, e.g. $A$2:$A$10. To toggle between the reference types, simply select the reference in the formular bar and press F4. For more informatiop, please see Absolute and relative cell references in Excel. Hello, I am trying to rank data based on a goal range. The goal is to score between 450 and 500. Currently anyone scoring 375 (as an example) is ranked higher than someone who met the goal falling between 450 and 500. Could you help me with a rank formula please? I need to rank negative numbers first descending then positive numbers ascending. The number closest to zero but negative is the highest ranked. The number farthest from zero but positive is the lowest ranked. The closest positive number from zero should be lower in rank than the farthest negative number from zero. For anyone having a problem with ranking skipping numbers, here is some help. See cells F35 and F40! You're welcome! If the data contains an error and we want to calculate the Rank ABS numbers ascending ignoring ERORR(ex. #value! or #n/a):, how can we do it? Is there any way to do rank where you don't skip? I would like it so that the 27 is a 3, is this possible? Is there any way to do the above based on a value in another column? Let's say column A contains a group number assignment (1,2 and 3).